THE SACRED POLE OF THE OMAHA TRIBE. In the Peabody Museum of Harvard University have been placed, for safe-keeping, the contents of two of the sacred tents of the Omaha tribe of Indians. 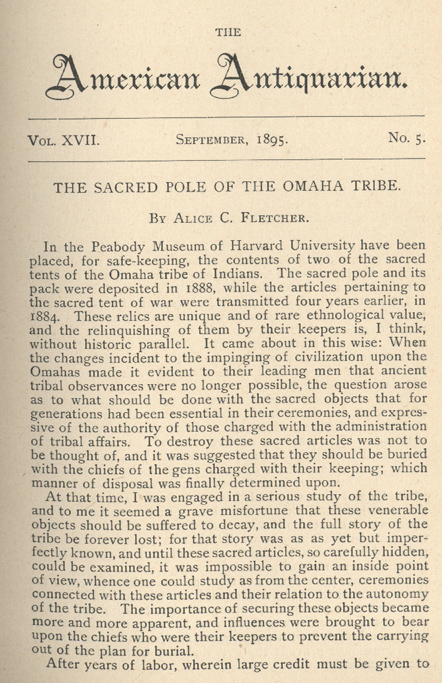 The sacred pole and its pack were deposited in 1888, while the articles pertaining to the sacred tent of war were transmitted four years earlier, in 1884. These relics are unique and of rare ethnological value, and the relinquishing of them by their keepers is, I think, without historic parallel. It came about in this wise: When the changes incident to the impinging of civilization upon the Omahas made it evident to their leading men that ancient tribal observances were no longer possible, the question arose as to what should be done with the sacred objects that for generations had been essential in their ceremonies, and expressive of the authority of those charged with the administration of tribal affairs. To destroy these sacred articles was not to be thought of, and it was suggested that they should be buried with the chiefs of the gens charged with their keeping; which manner of disposal was finally determined upon. At that time, I was engaged in a serious study of the tribe, and to me it seemed a grave misfortune that these venerable objects should be suffered to decay, and the full story of the tribe be forever lost; for that story was as as yet but imperfectly known, and until these sacred articles, so carefully hidden, could be examined, it was impossible to gain an inside point of view, whence one could study as from the center, ceremonies connected with these articles and their relation to the autonomy of the tribe. The importance of securing these objects became more and more apparent, and influences were brought to bear upon the chiefs who were their keepers to prevent the carrying out of the plan for burial. the late Joseph La Flesche, former head chief of the tribe, and to his son, the sacred articles were finally deposited in the Peabody Museum of Harvard University. The transfer was not effected without dramatic incidents evidencing the awe in which these objects were held—objects which, in their unpretending appearance, give little idea of the important part they have played in the history of more than one Indian tribe of our country. 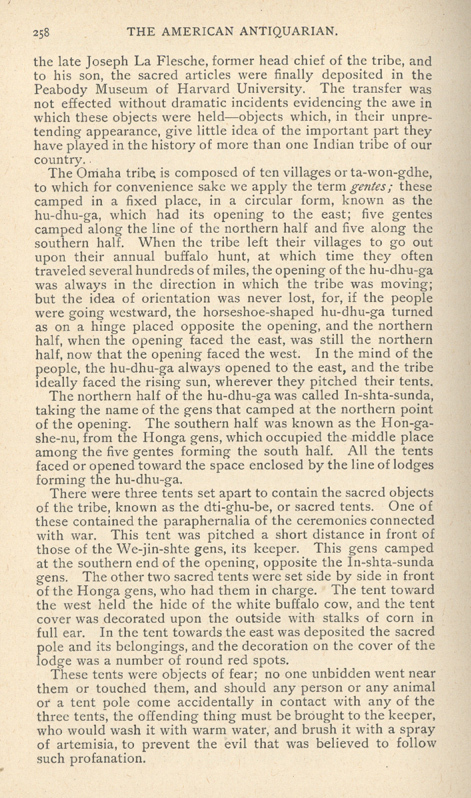 The Omaha tribe is composed of ten villages or ta-won-gdhe, to which for convenience sake we apply the term gentes; these camped in a fixed place, in a circular form, known as the hu-dhu-ga, which had its opening to the east; five gentes camped along the line of the northern half and five along the southern half. When the tribe left their villages to go out upon their annual buffalo hunt, at which time they often traveled several hundreds of miles, the opening of the hu-dhu-ga was always in the direction in which the tribe was moving; but the idea of orientation was never lost, for, if the people were going westward, the horseshoe-shaped hu-dhu-ga turned as on a hinge placed opposite the opening, and the northern half, when the opening faced the east, was still the northern half, now that the opening faced the west. In the mind of the people, the hu-dhu-ga always opened to the east, and the tribe ideally faced the rising sun, wherever they pitched their tents. The northern half of the hu-dhu-ga was called In-shta-sunda, taking the name of the gens that camped at the northern point of the opening. The southern half was known as the Hon-gashe-nu, from the Honga gens, which occupied the middle place among the five gentes forming the south half. All the tents faced or opened toward the space enclosed by the line of lodges forming the hu-dhu-ga. There were three tents set apart to contain the sacred objects of the tribe, known as the dti-ghu-be, or sacred tents. One of these contained the paraphernalia of the ceremonies connected with war. This tent was pitched a short distance in front of those of the We-jin-shte gens, its keeper. This gens camped at the southern end of the opening, opposite the In-shta-sunda gens. The other two sacred tents were set side by side in front of the Honga gens, who had them in charge. The tent toward the west held the hide of the white buffalo cow, and the tent cover was decorated upon the outside with stalks of corn in full ear. In the tent towards the east was deposited the sacred pole and its belongings, and the decoration on the cover of the lodge was a number of round red spots. These tents were objects of fear; no one unbidden went near them or touched them, and should any person or any animal or a tent pole come accidentally in contact with any of the three tents, the offending thing must be brought to the keeper, who would wash it with warm water, and brush it with a spray of artcmisia, to prevent the evil that was believed to follow such profanation. The sacred pole is of cottonwood and bears marks of great age. It has been subjected to manipulation; the bark has been removed and the pole shaped and shaved at both ends, the top or "head" rounded into a cone shaped knob and the lower end trimmed to a dull point. Its circumference near the head is 15 cm. 2 mm. ; the middle part increases to 19 cm. and is diminished toward the foot to 14 cm. 6 mm. To the lower end is fastened by strips of tanned hide, a piece of harder wood, probably ash, 55 cm. 2 1/2 mm. in length, rounded at top with a groove cut to prevent the straps slipping, and with the lower end sharpened so as to be easily driven into the ground. There is a crack in the sacred pole extending several cm. above this foot piece, which has probably given rise to a modern idea that this foot piece was added to strengthen or mend the pole when it had become worn with long usage. But the pole itself shows no indication of ever having been in the ground; there is no decay apparent, as is shown on the foot piece whose flattened top proves that it was driven into the ground. Moreover, the name of this piece of wood is zhi-be, leg, and as the pole itself represents a man, and as this name zhi-be is not applied to a piece of wood spliced on to lengthen a pole, it is probable that a foot piece was originally attached to the pole. Upon this zhi-be, or leg, the pole rested; it was never placed upright, but inclined forward at an angle of about forty-five degrees, and was held firmly in place by a stick tied to it about 1 m. and 46 cm. from its "head." The native name of this support is i-mon-gdhe, a staff, such as old men lean upon. Upon the top or "head" of the pole was tied a large scalp, ni-ka mon-ghi-ha. About one end, 14 cm. 5 mm. 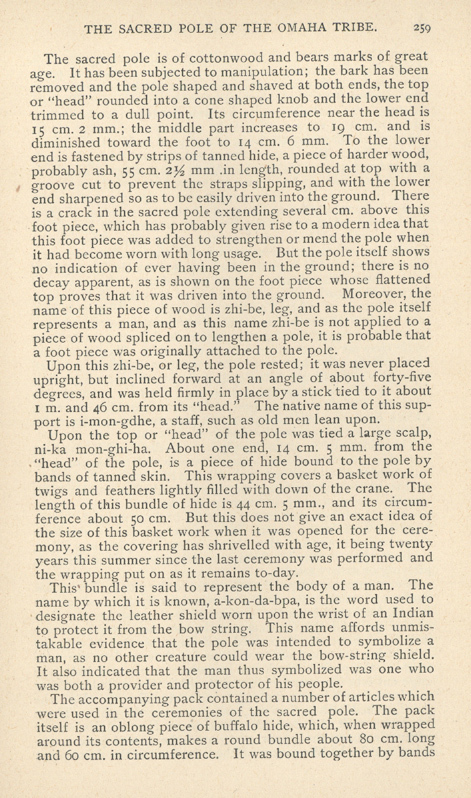 from the "head" of the pole, is a piece of hide bound to the pole by bands of tanned skin. This wrapping covers a basket work of twigs and feathers lightly filled with down of the crane. The length of this bundle of hide is 44 cm. 5 mm., and its circumference about 50 cm. But this does not give an exact idea of the size of this basket work when it was opened for the ceremony, as the covering has shrivelled with age, it being twenty years this summer since the last ceremony was performed and the wrapping put on as it remains to-day. This bundle is said to represent the body of a man. The name by which it is known, a-kon-da-bpa, is the word used to designate the leather shield worn upon the wrist of an Indian to protect it from the bow string. This name affords unmistakable evidence that the pole was intended to symbolize a man, as no other creature could wear the bow-string shield. It also indicated that the man thus symbolized was one who was both a provider and protector of his people. of rawhide and was called wa-dhi-gha-be, meaning literally, things flayed, referring to the scalps stored within the pack. Nine were found in it when I opened the pack at the museum, and some of them show signs of considerable wear. They are all very large and on one is the remains of a feather, all of which has been worn away but the quill. The pipe belonging to the pole and used in its rites was kept in this pack. The stem is round and 89 cm. in length. It is probably of ash, and shows marks of long usage. The bowl is of red catlinite I2 cm. 5 mm. at its greatest length, and 7 cm. 2 mm. in height. The bowl proper rises 4 cm. 5 mm. from the base. Upon the sides and bottom of the stone certain figures are incised which are difficult to determine; they may be a conventionalized bird grasping the pipe. The lines of the figures are filled with a semi-lustrous black substance, composed of vegetable matter, which brings the design into full relief; this black substance is also painted upon the front and back of the bowl, leaving a band of red showing at the sides. The effect is of a black and red inlaid pipe. When this pipe was smoked, the stone end rested on the ground; it was not lifted, but dragged by the stem as it passed from man to man while they sat in the sacred tent or enclosure. 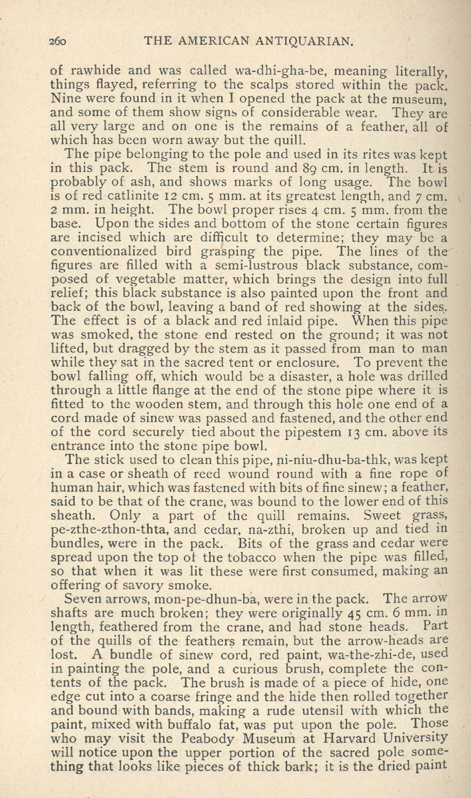 To prevent the bowl falling off, which would be a disaster, a hole was drilled through a little flange at the end of the stone pipe where it is fitted to the wooden stem, and through this hole one end of a cord made of sinew was passed and fastened, and the other end of the cord securely tied about the pipestem 13 cm. above its entrance into the stone pipe bowl. The stick used to clean this pipe, ni-niu-dhu-ba-thk, was kept in a case or sheath of reed wound round with a fine rope of human hair, which was fastened with bits of fine sinew; a feather, said to be that of the crane, was bound to the lower end of this sheath. Only a part of the quill remains. Sweet grass, pe-zthe-zthon-thta, and cedar, na-zthi, broken up and tied in bundles, were in the pack. Bits of the grass and cedar were spread upon the top of the tobacco when the pipe was filled, so that when it was lit these were first consumed, making an offering of savory smoke. that remains from the numerous anointings of the pole, which ceremony was a thank offering for successful hunts and a prayer for future prosperity. The anointing or painting of the pole took place in July, toward the close of the annual buffalo hunt, after the tribe had reached that portion of their hunting grounds where they felt themselves reasonably secure from their enemies. The custom long ago, beyond the memory of the oldest men, so I was told by the chief of the Honga in 1888, was to perform this ceremony twice a year, after the summer and winter hunt, but, within his memory and that of his father, it had been held only in the summer. The rapid destruction of the herds of buffalo in the decade following 1870 caused the Indian not only sore physical discomfort, but also great mental distress. His religious ceremonies needed the buffalo for their observance, and its disappearance, which in its suddenness seemed to him supernatural, has done much to demoralize the Indian, morally as well as socially. No one can have his sacred rites overturned in a day and preserve his mental equipoise. seemingly powerless to bring back the old time prosperity to the people. When, in 1888, the pole was finally placed for safe keeping in the museum at Harvard University, it seemed very important to secure its legend, known to the chief of the Honga. The fear inspired by the pole was such that it seemed as though it would be impossible to gain this desired information, but it was finally brought about; and one summer day in September, the chief, Shu-de-non-zhe, came to the house of Joseph La Flesche, to tell the tradition of his people, as given in the legend of the pole. It was a memorable day; the harvest was ended and tall stacks of wheat cast their shadows over the stubble fields that were once covered with buffalo grass. The past was irrevocably gone. The old man had consented to speak, but not without misgivings, until his former head chief cheerfully accepted for himself any penalty that might follow the revealing of these sacred traditions, which was held to be a profanation punishable by supernatural death. While the old chief talked he continually tapped the floor with a little stick he held in his hand, marking with it the rythm peculiar to the drumming of a man who is invoking the unseen powers during the performance of certain rites. His eyes were cast down, his speech was deliberate, and his voice low, as if speaking to himself alone. The scene in that little room where we four sat was solemn, as at the obsequies of a past once so full of human activity and hope. The fear inspired by the pole was strengthened in its very passing away. 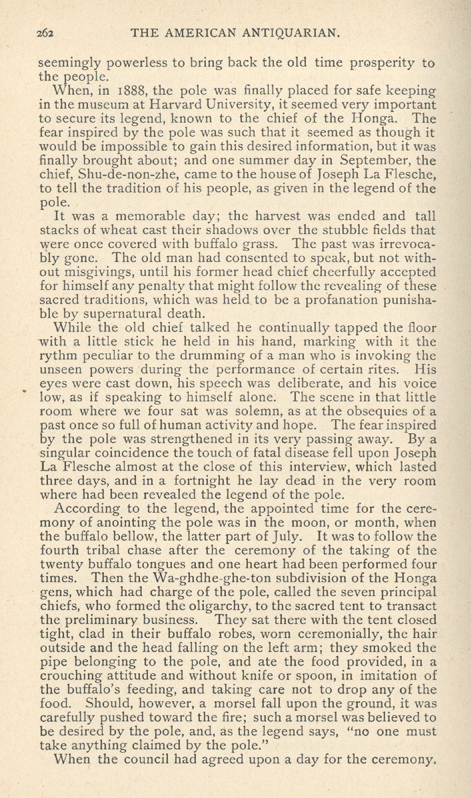 By a singular coincidence the touch of fatal disease fell upon Joseph La Flesche almost at the close of this interview, which lasted three days, and in a fortnight he lay dead in the very room where had been revealed the legend of the pole. According to the legend, the appointed time for the ceremony of anointing the pole was in the moon, or month, when the buffalo bellow, the latter part of July. It was to follow the fourth tribal chase after the ceremony of the taking of the twenty buffalo tongues and one heart had been performed four times. Then the Wa-ghdhe-ghe-ton subdivision of the Honga gens, which had charge of the pole, called the seven principal chiefs, who formed the oligarchy, to the sacred tent to transact the preliminary business. They sat there with the tent closed tight, clad in their buffalo robes, worn ceremonially, the hair outside and the head falling on the left arm; they smoked the pipe belonging to the pole, and ate the food provided, in a crouching attitude and without knife or spoon, in imitation of the buffalo's feeding, and taking care not to drop any of the food. Should, however, a morsel fall upon the ground, it was carefully pushed toward the fire; such a morsel was believed to be desired by the pole, and, as the legend says, "no one must take anything claimed by the pole." When the council had agreed upon a day for the ceremony. runners were sent out to search for a herd of buffalo, and, if one was found within four days, it was accounted a sacred herd, and the chase that took place provided fresh meat for the coming ceremony. If, however, within four days, the runners failed to discover a herd, dried meat preserved from their previous hunt was used. In this preliminary council, each chief, as he took a reed from a bundle kept in the sacred tent, mentioned the name of a man of valorous exploits. 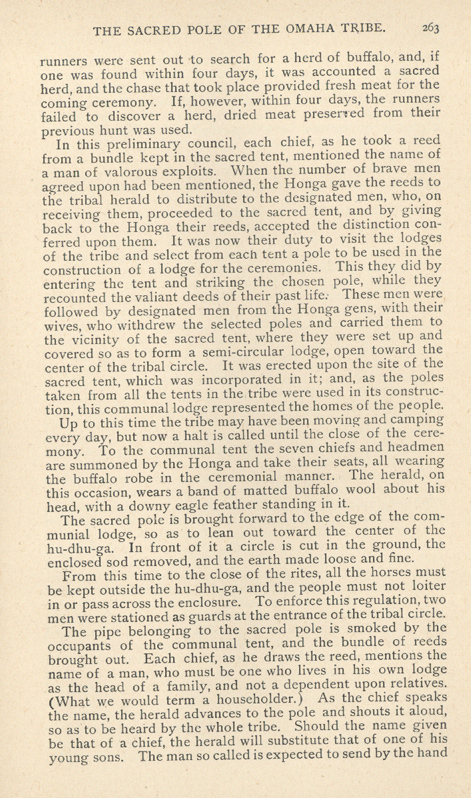 When the number of brave men agreed upon had been mentioned, the Honga gave the reeds to the tribal herald to distribute to the designated men, who, on receiving them, proceeded to the sacred tent, and by giving back to the Honga their reeds, accepted the distinction conferred upon them. 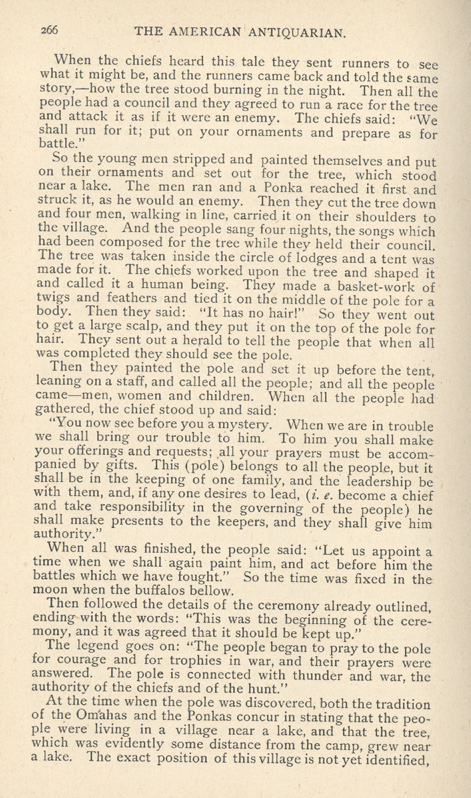 It was now their duty to visit the lodges of the tribe and select from each tent a pole to be used in the construction of a lodge for the ceremonies. This they did by entering the tent and striking the chosen pole, while they recounted the valiant deeds of their past life: These men were followed by designated men from the Honga gens, with their wives, who withdrew the selected poles and carried them to the vicinity of the sacred tent, where they were set up and covered so as to form a semi-circular lodge, open toward the center of the tribal circle. It was erected upon the site of the sacred tent, which was incorporated in it; and, as the poles taken from all the tents in the tribe were used in its construction, this communal lodge represented the homes of the people. Up to this time the tribe may have been moving and camping every day, but now a halt is called until the close of the ceremony. 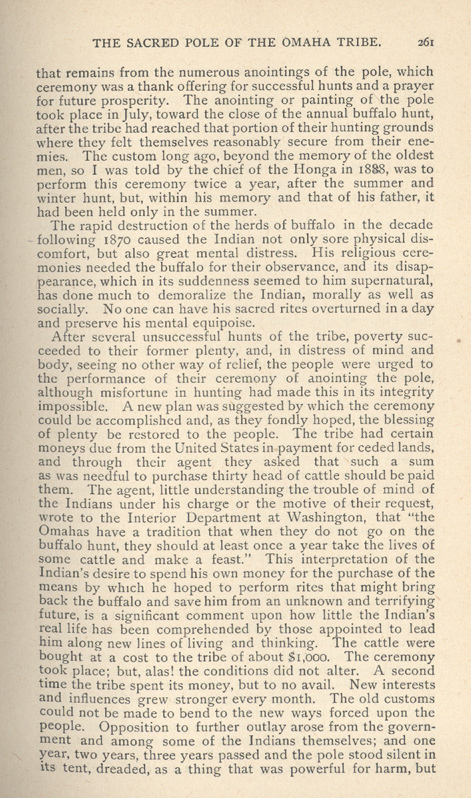 To the communal tent the seven chiefs and headmen are summoned by the Honga and take their seats, all wearing the buffalo robe in the ceremonial manner. The herald, on this occasion, wears a band of matted buffalo wool about his head, with a downy eagle feather standing in it. The sacred pole is brought forward to the edge of the communial lodge, so as to lean out toward the center of the hu-dhu-ga. In front of it a circle is cut in the ground, the enclosed sod removed, and the earth made loose and fine. From this time to the close of the rites, all the horses must be kept outside the hu-dhu-ga, and the people must not loiter in or pass across the enclosure. To enforce this regulation, two men were stationed as guards at the entrance of the tribal circle. of his children the finest and fattest piece of the buffalo meat, of a peculiar cut, known as ta-ghu. If the meat is too heavy for the children, the parents help carry it to the communal tent. The little ones are full of dread, and particularly fear the fat, which is to be used upon the pole. So, as they trudge along, every now and then they stop to wipe their wee fingers on the grass so as to escape any blame or possible guilt of sacrilege. Should any one refuse to make this offering to the pole he would be struck by lightning, be wounded in battle, or lose a limb by a splinter running into his foot. The gathering of the meat occupies three days, during which the Honga are singing at intervals, by day and night, the sacred songs, which echo through the camp and enter into the dreams of the children. The songs belonging to the ritual of the corn are first sung, followed by those relating to the hunt, all in their proper sequence. If a mistake in the order is made, the Honga lift up their hands and weep aloud, until the herald, advancing from the sacred pole, wipes away the tears with his hands, and the wail ceases, and the songs go on. On the morning of the fourth clay the meat is spread upon the ground before the pole in parallel rows, the full length of the communal lodge. The keeper of the pole and his wife then advance to perform their part in the ceremony. He is clothed in the usual shirt and leggings, and his cheeks are painted in red bands. The woman wears over her gala dress a buffalo robe, with the skin outside, which is painted red, so are her cheeks, and bands of the same color are on her glossy, black hair, and to the heel of each of her moccasins is attached a strip of buffalo hair, like a tail. Songs precede and describe every act of the keeper. 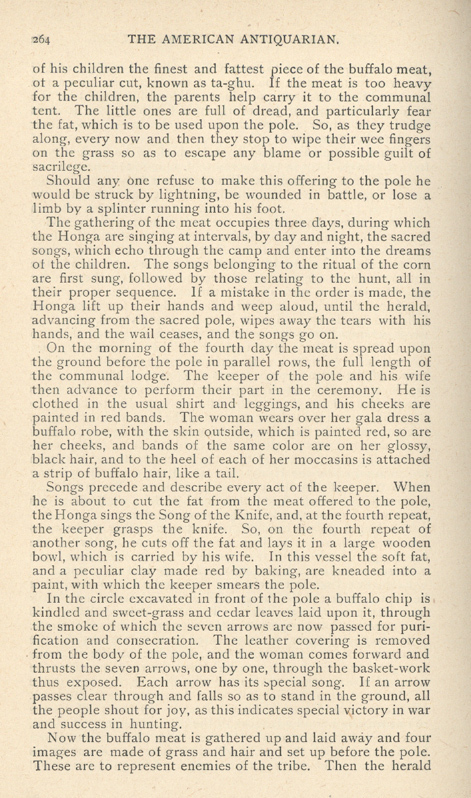 When he is about to cut the fat from the meat offered to the pole, the Honga sings the Song of the Knife, and, at the fourth repeat, the keeper grasps the knife. So, on the fourth repeat of another song, he cuts off the fat and lays it in a large wooden bowl, which is carried by his wife. In this vessel the soft fat, and a peculiar clay made red by baking, are kneaded into a paint, with which the keeper smears the pole. In the circle excavated in front of the pole a buffalo chip is kindled and sweet-grass and cedar leaves laid upon it, through the smoke of which the seven arrows are now passed for purification and consecration. The leather covering is removed from the body of the pole, and the woman comes forward and thrusts the seven arrows, one by one, through the basket-work thus exposed. Each arrow has its special song. If an arrow passes clear through and falls so as to stand in the ground, all the people shout for joy, as this indicates special victory in war and success in hunting. goes forth shouting, "Pity me, my young men, and let me once more complete my ceremonies." Meaning by this that the men of the tribe should lay aside all other affairs and considerations and devote themselves to the part they are to play in the final act of the ceremony. 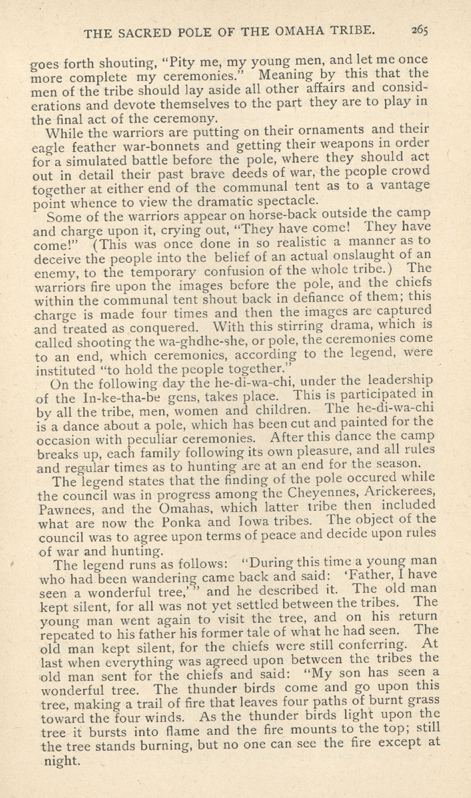 While the warriors are putting on their ornaments and their eagle feather war-bonnets and getting their weapons in order for a simulated battle before the pole, where they should act out in detail their past brave deeds of war, the people crowd together at either end of the communal tent as to a vantage point whence to view the dramatic spectacle. Some of the warriors appear on horse-back outside the camp and charge upon it, crying out, "They have come! They have come!" (This was once done in so realistic a manner as to deceive the people into the belief of an actual onslaught of an enemy, to the temporary confusion of the whole tribe.) The warriors fire upon the images before the pole, and the chiefs within the communal tent shout back in defiance of them; this charge is made four times and then the images are captured and treated as conquered. With this stirring drama, which is called shooting the wa-ghdhe-she, or pole, the ceremonies come to an end, which ceremonies, according to the legend, were instituted "to hold the people together." On the following day the he-di-wa-chi, under the leadership of the In-ke-tha-he gens, takes place. This is participated in by all the tribe, men, women and children. The he-di-wa-chi is a dance about a pole, which has been cut and painted for the occasion with peculiar ceremonies. After this dance the camp breaks up, each family following its own pleasure, and all rules and regular times as to hunting are at an end for the season. The legend states that the finding of the pole occured while the council was in progress among the Cheyennes, Arickerees, Pawnees, and the Omahas, which latter tribe then included what are now the Ponka and Iowa tribes. The object of the council was to agree upon terms of peace and decide upon rules of war and hunting. The legend runs as follows: "During this time a young man who had been wandering came back and said: 'Father, I have seen a wonderful tree,'" and he described it. The old man kept silent, for all was not yet settled between the tribes. The young man went again to visit the tree, and on his return repeated to his father his former tale of what he had seen. The old man kept silent, for the chiefs were still conferring. At last when everything was agreed upon between the tribes the old man sent for the chiefs and said: "My son has seen a wonderful tree. The thunder birds come and go upon this tree, making a trail of fire that leaves four paths of burnt grass toward the four winds. As the thunder birds light upon the tree it bursts into flame and the fire mounts to the top; still the tree stands burning, but no one can see the fire except at night. When the chiefs heard this tale they sent runners to see what it might be, and the runners came back and told the same story,—how the tree stood burning in the night. Then all the people had a council and they agreed to run a race for the tree and attack it as if it were an enemy. The chiefs said: "We shall run for it; put on your ornaments and prepare as for battle." So the young men stripped and painted themselves and put on their ornaments and set out for the tree, which stood near a lake. The men ran and a Ponka reached it first and struck it, as he would an enemy. Then they cut the tree down and four men, walking in line, carried it on their shoulders to the village. And the people sang four nights, the songs which had been composed for the tree while they held their council. The tree was taken inside the circle of lodges and a tent was made for it. The chiefs worked upon the tree and shaped it and called it a human being. They made a basket-work of twigs and feathers and tied it on the middle of the pole for a body. Then they said: "It has no hair!" So they went out to get a large scalp, and they put it on the top of the pole for hair. They sent out a herald to tell the people that when all was completed they should see the pole. "You now see before you a mystery. When we are in trouble we shall bring our trouble to him. To him you shall make your offerings and requests; all your prayers must be accompanied by gifts. This (pole) belongs to all the people, but it shall be in the keeping of one family, and the leadership be with them, and, if any one desires to lead, (i.e. become a chief and take responsibility in the governing of the people) he shall make presents to the keepers, and they shall give him authority." When all was finished, the people said: "Let us appoint a time when we shall again paint him, and act before him the battles which we have fought." So the time was fixed in the moon when the buffalos bellow. Then followed the details of the ceremony already outlined, ending with the words: "This was the beginning of the ceremony, and it was agreed that it should be kept up." The legend goes on: "The people began to pray to the pole for courage and for trophies in war, and their prayers were answered. The pole is connected with thunder and war, the authority of the chiefs and of the hunt." but it was in all probability at no great distance from the red pipe stone quarry on the southwestern part of South Dakota. Time forbids an enumeration of my historical research in this connection, but the oldest records and authentic maps indicate that the pole could not have been cut at any time since 1673. The establishment of the order of chieftainship and the government of the tribe as it has been known during the present century, antedated the institution of the pole. Several political changes had already taken place before that event. I can not, at this time, recount and analyze the legend of the seven old men, who are said to have instituted the government by seven chiefs, and to have established the ni-ni-ba-ton or pipe subgens in certain of the ten gentes of the tribe. This legend deals with a political change and a religious innovation that long antedated the advent of the sacred pole. When the seven old men introduced the sacred tribunal pipes there were already in the tribe three distinct groups of insignia of as many forms of worship, namely: The Four Sacred Stones, in the custody of the Ma-then-ga-ge-he gens, having their peculiar ritual; the Honor Pack, the Sacred Shell and the Pole of Red Cedar, of the Thunder Rites, in charge of the We-gin-shte gens; and the song and ritual of the Hede-wache, committed to the Inkcthabe gens. The entrance of the Omahas into the group of tribes that agreed to respect and to observe the ceremony of the Wa-wan, Pipes or Calumets of Fellowship, not only tempered their sun-worship through the teachings of the ritual of this ceremony, but opened a new path to tribal honor by which a man of valor and industry could reach equality with the hereditary chiefs in the government of the tribe. 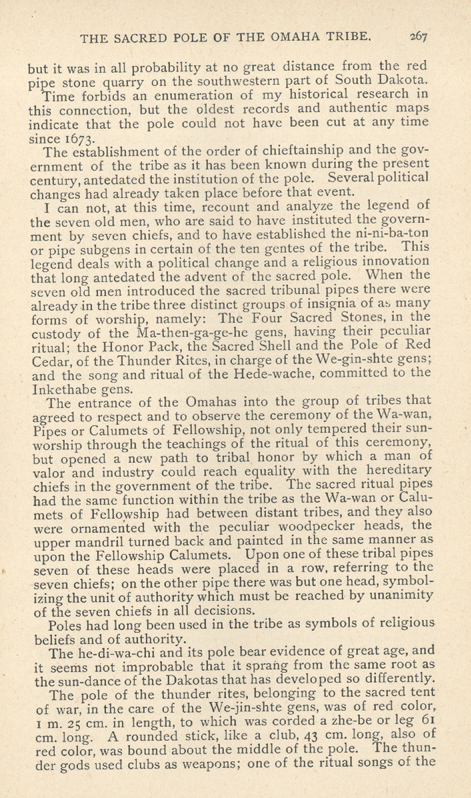 The sacred ritual pipes had the same function within the tribe as the Wa-wan or Calumets of Fellowship had between distant tribes, and they also were ornamented with the peculiar woodpecker heads, the upper mandril turned back and painted in the same manner as upon the Fellowship Calumets. Upon one of these tribal pipes seven of these heads were placed in a row, referring to the seven chiefs; on the other pipe there was but one head, symbolizing the unit of authority which must be reached by unanimity of the seven chiefs in all decisions. Poles had long been used in the tribe as symbols of religious beliefs and of authority. The he-di-wa-chi and its pole bear evidence of great age, and it seems not improbable that it sprang from the same root as the sun-dance of the Dakotas that has developed so differently. tent of war says: "Your grandfather, fearful to behold is he! When our grandfather lifts his long club, he is fearful to behold!" In olden time, when the rites were performed in the spring, when the first thunder peal was heard, a part of the ceremony was the painting of this pole. It is probable that this pole was the prototype of the sacred pole; the two have features in common. The zhi-be, or leg; the body on the one being the thunder club, and on the other bearing the name of the bow-shield, used by warriors to protect the wrist from the bow-string; both poles were painted with due ceremony at appointed times; both referred more or less directly to thunder, and any profanation of either was avenged by that power, the guilty being struck by lightning. It will be recalled that attention was first drawn to the tree, from which the sacred pole was shaped, by the thunder birds coming to it from the four quarters and the mysterious burning that followed; so that the pole became, in the minds of the people, endowed with supernatural power by the ancient thunder gods. The government by the seven chiefs was at first confined to hereditary rulers, drawn from certain sub-divisions of certain gentes. By a slow process in the course of time men of ability rose into power and honors were won and worn by those whom the people recognized as leaders, until, at last, the oligarchy of seven became representative of individual attainment, and of gentes and sub-gentes hitherto debarred from participation in the governmental affairs of the tribe. 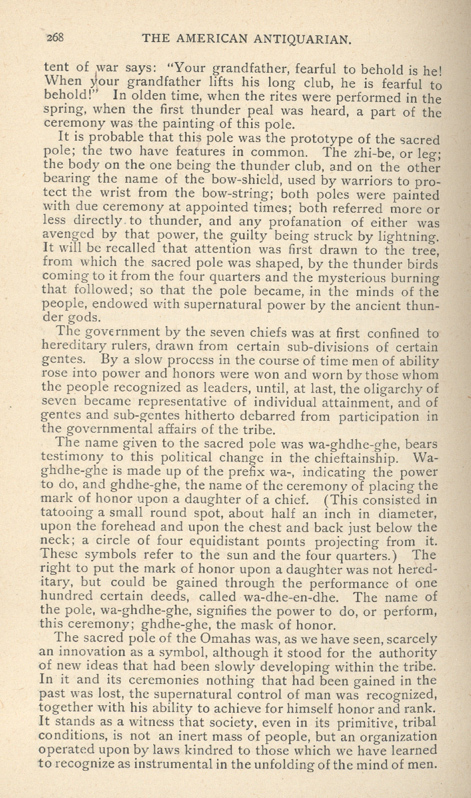 The name given to the sacred pole was wa-ghdhe-ghe, bears testimony to this political change in the chieftainship. Waghdhe-ghe is made up of the prefix wa-, indicating the power to do, and ghdhe-ghe, the name of the ceremony of placing the mark of honor upon a daughter of a chief. (This consisted in tatooing a small round spot, about half an inch in diameter, upon the forehead and upon the chest and back just below the neck; a circle of four equidistant points projecting from it. These symbols refer to the sun and the four quarters.) The right to put the mark of honor upon a daughter was not hereditary, but could be gained through the performance of one hundred certain deeds, called wa-dhe-en-dhe. The name of the pole, wa-ghclhe-ghe, signifies the power to do, or perform, this ceremony; ghdhe-ghe, the mask of honor. The sacred pole of the Omahas was, as we have seen, scarcely an innovation as a symbol, although it stood for the authority of new ideas that had been slowly developing within the tribe. In it and its ceremonies nothing that had been gained in the past was lost, the supernatural control of man was recognized, together with his ability to achieve for himself honor and rank. It stands as a witness that society, even in its primitive, tribal conditions, is not an inert mass of people, but an organization operated upon by laws kindred to those which we have learned to recognize as instrumental in the unfolding of the mind of men.